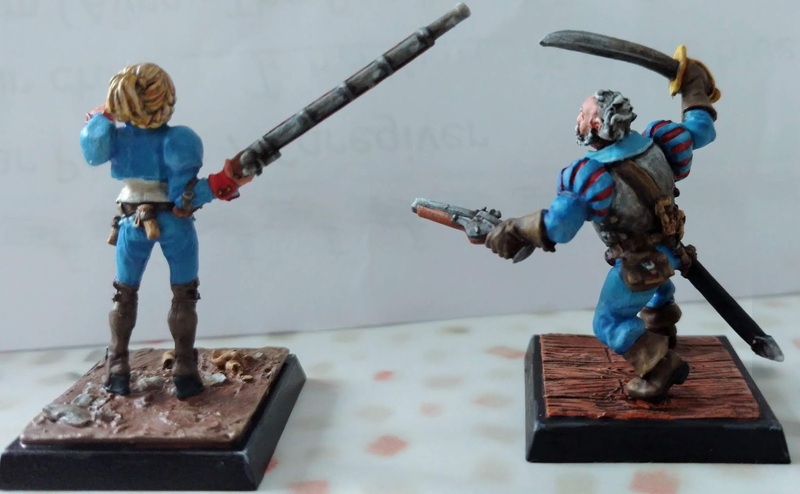 My Hobbyblog about painting, skirmish and roleplaying games. Here's another weekly update with something that isn't 15mm this time. Soon I will be going back to Belgium for a short holiday to meet family and friends and I decided to use this opportunity to get rid of some non-15mm while I'm there. Offering stuff to my friends is probably the best way to get started and Lucky for me they didn't disappoint when I contacted them. However, some miniatures accidentally moved to Australia over the course of our stay here and I need to take these with me when I go, among them two partially painted miniatures for Freebooter's Fate. To do my friend who likes to buy them a favour, I painted these up already. This way he's got a painted starter set to begin with. For those who don't know the game: Freebooter's Fate is a German game about pirates (duh) and their antics. What's different about the game is that it doesn't use any dice at all but a rather unique card mechanic, unique even compared to other games with cards like Malifaux. 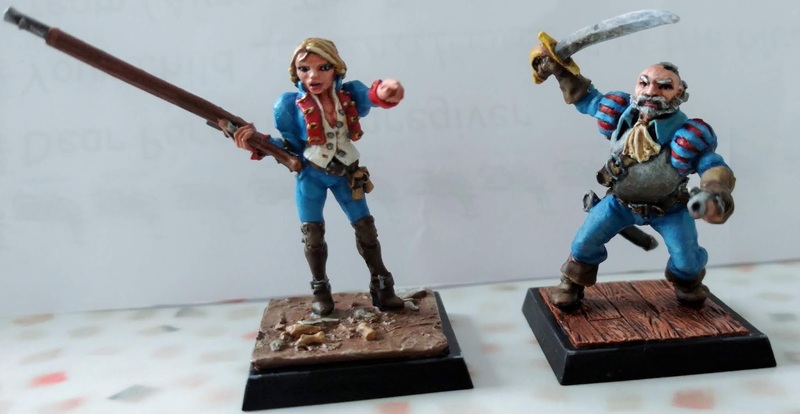 I must admit it felt a bit weird painting 28mm miniatures again; they're far from perfect, but with only four hours/model (which is almost speedpainting for me) I can't complain about the result. Seeing them now together I feel like my painting skills have evolved. Back then I was using techniques which were new to me, like NMM and I learned a lot in a short time while now I got more tricks; though it took me longer to learn them. That's it for this week, thank you very much for reading. They all look good Wouter, nice work. Cheers Fred, it was surprisingly refreshingly to do 28mm again. Awesome work Wouter ! Fantastic paint-job ! Your friend will be very happy ! Cheers Mario, I hope he will (he's a bit of a perfectionist 😁). Wonderful group, Especially the guy with the red cape looks superb! Thanks Skully, he's the leader so I spend quite some time painting him. Glad to hear that it shows. I didn't know these and they are superb. What a nice paintjob! Thank you for the kind words Suber! Happy to see you still got time to do some blogging 😊. Thank you very much Leon. It's a wonderful little game and far too few people actually play it 😊. Thanks a lot for the comment Kuan. It's often strange how much your body remembers while your brain isn't confident about it. I was a bit astonished on how smooth painting went after not doing anything for half a year. So I guess it will go rather well when you try it again. Beautiful and colorful! I love the wooden floors! Thank you very much, it's a simple formula but it works and that's what counts :).